Bankruptcy Loveland: Is Your Case Going To Be Simple Or Difficult? 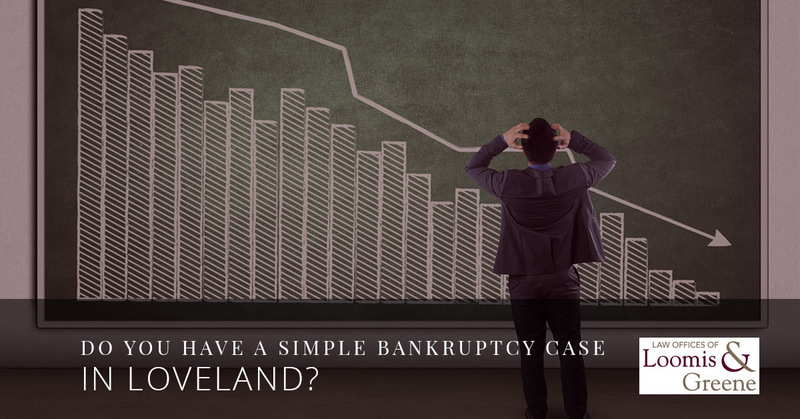 Do You Have A Simple Bankruptcy Case In Loveland? If we lived in a perfect world, no one would ever have to file bankruptcy. Unfortunately, this is not the case. In fact, it’s not even realistic to think that filing for bankruptcy is simple for every person who has to do it. Even if you think that your personal bankruptcy case is going to be a simple one, you could be wrong. Even the most common debt issues can lead to an extremely complicated bankruptcy case. However, it’s imperative that you determine sooner rather than later. Knowing how extensive your case will be can help you to make your expectations realistic and will also give you a better idea whether you need to hire a bankruptcy attorney or not. What is a Simple Bankruptcy? In all actuality, there are very few bankruptcies that would be considered simple. More often than not, there are legal issues which cause complications in bankruptcy situations, which make forming a plan to get you out of debt even more difficult. This often can result in you having to pay more attorney fees, fill out more paperwork and make more complicated decisions before you are able to actually file. You have an income that is less than the state median income for your household size. You do not have that many assets and you know you can exempt all of them. You have unsecured debt only. You are able to discharge all of your debt. You have filed all of your tax returns. You have no factors that would complicate the process. 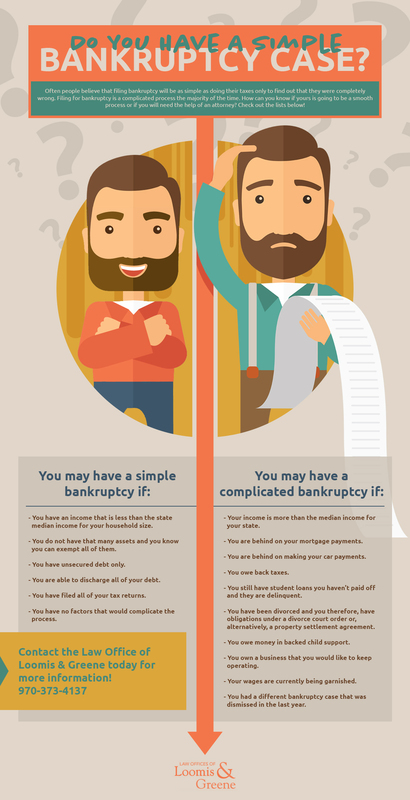 What can complicate your bankruptcy? Your income is more than the median income for your state. You are behind on making your car payments. You still have student loans you haven’t paid off and they are delinquent. You have been divorced and therefore, have obligations under a divorce court order or, alternatively, a property settlement agreement. You owe money in backed child support. You own a business that you would like to keep operating. You had a different bankruptcy case that was dismissed in the last year. Should you hire a Loveland Bankruptcy Attorney? 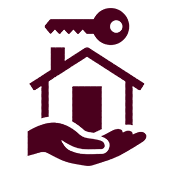 If you are curious whether or not your case is simple or whether or not you are going to have to hire a bankruptcy attorney in Loveland to handle it, feel free to contact us today. We can absolutely give you a better idea of what you can expect as you attempt to file for bankruptcy. The Law Office of Loomis and Greene has a talented legal team who can help you every step of the way. Call us right now and begin the process of filing for bankruptcy.